Selecting the best non-dairy protein powder can be testing due to the varying products on the market. Protein powders are a popular nutritional supplement, generally used by those who work out. However, many others can also benefit from protein powders. Growing teenagers, those who are recovering from an injury and those who are trying to build more muscle all require extra protein. Therefore, protein powders can provide a good, convenient source of source of high-quality protein for those who require it. 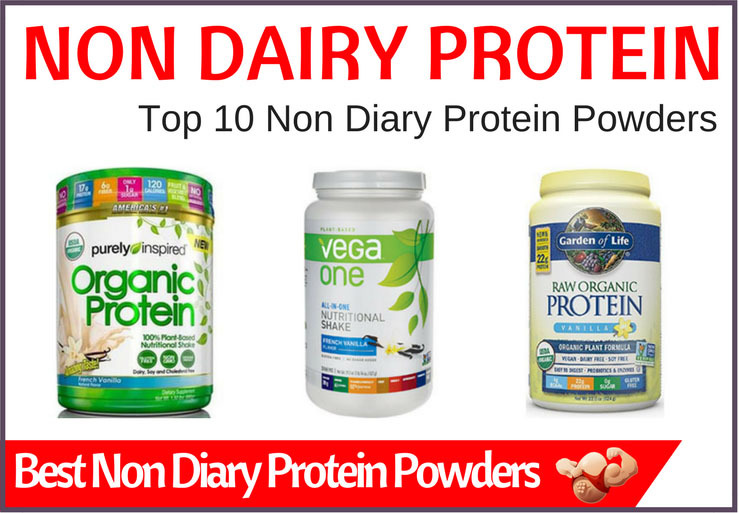 A non-dairy protein powder is ideal for a vegan, those who are dairy intolerant or those who simply want to follow a dairy free diet. To help you discover the best non-dairy protein powder for your requirements, we’ve collated a list of the best non-dairy protein powder reviews, designed to bring you the best choice in terms of formulation, volume and price. Non-dairy protein powders can be manufactured with differing ingredients, as well as using variations in packaging and size. Soy powder is a complete protein, providing essential amino acids and other benefits. It contains less fat and cholesterol than whey powder and a 2013 research study published in the Journal of Women & Aging revealed that those with osteoporosis who used soy isolate powder gained bone strength and muscle during a 12 week period even without exercise. Plant based powders are another option for dairy free protein powders, however, these are less complete than soy. Plant based powders, such as hemp, brown rice or pea,are not studied in the same way as soy or regular protein powders so their effects are less known. Pea protein﻿ powder is fat, cholesterol and gluten free as well as being affordable to purchase. However, it doesn’t contain the amino acid cysteine so you could try mixing it into your routine with other supplements. Hemp protein powder is considered to be a superfood as its rich in omega 3 and 6 fatty acids. As its plant based, its easy to digest. However, due to its high fat content, it contains more calories so its not ideal for weight loss. Brown rice protein powder is gluten free, but its lacking in lysine so it’s not ideal to use solely. Its best to use it with other plant based powders. Whey and Casein are two popular forms of regular protein powder. These forms tend to be cheaper and more attainable than others. Whey is very common amongst those who participate in sports or exercise. There are varying forms, such as isolate, which refers to the purification process used to get the purest form of whey powder. Alternatively, hydrolyzed whey powder is considered quicker to digest. Casein powder is also from dairy and is the main protein found in cow’s milk. It digests slower than whey powder so it may not be ideal for those who require nutrients quickly, for example, after a workout. Vegan protein powders can be plant or soy based and can be as effective as dairy blends. While vegan blends may be more expensive, they are an easy and convenient way for vegetarians and vegans to get enough protein in their diet. Even though there has been a long held view that plant based protein powders are inferior to animal based protein powders (particularly whey); there is now research to suggest this is not true. ​Brown rice protein ​is just as efficient as ​whey protein for building and maintaining muscle (according to a recent study). ​The​​​​ study pitted whey against rice protein over 6 weeks of training. Both groups showed statistically similar results when it came to body composition. Rice protein had done just as good a job at building muscle and maintaining it, as whey had. Another study ​comparing pea protein and whey protein found no difference between two groups taking either one over a 12 week trial, when it came to muscle thickness and strength. ​Pea protein is just as effective as whey protein too. So if you have your doubts about a non dairy protein powder living up to expectations, don't. They are just as effective as the golden child whey. Meat protein powder is commonly found as beef protein. Beef protein is a high-quality protein source and contains all nine amino acids that are essential for building muscle. Vega – Offering premium, plant based food alternatives, Vega are a leading brand of nutritional supplements. Vega offer shakes and powder to fulfil your protein needs, whether you’re a vegan who requires a protein source or you’re a sports enthusiast who needs protein after a workout. Sunwarrior –As a brand committed to providing the best quality plant based supplements, Sunwarrior are a growing nutritional company using organic ingredients and recycled packaging materials. Garden of Life– Manufacturing clean, pure blends for nutritional supplements, Garden of Life offer organic, certified gluten free products, from organic plant protein to protein with added fiber. Volume, price and efficacy are three factors that consumers look for when purchasing a non-dairy protein powder and what is considered when establishing a top 5 list of the best non-dairy protein powders on the market. Discovering this top list will help you to determine which brands are trusted and enjoyed by consumers. Here are the top non-dairy protein powders. There are many reasons why this product tops our list. 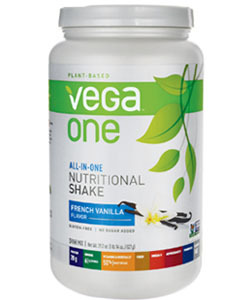 The Vega One All-In-One Plant Based Protein Powder in French Vanilla provides 20 servings. Containing 20g of plant based protein from hemp, pea, Saviseed and flax to provide complete protein, it also provides 50% of your recommended daily vitamin intake as well as 25% of your daily fiber intake. Vegan certified and gluten free, there is no added sugar and the French Vanilla flavor is delicious to taste. While the product is slightly more expensive than other brands, the overall premium quality, volume and blend makes this a highly recommended selection. As one of the top-rated products on Amazon, many consumers suggest trying this non-dairy protein powder as a nutritional supplement for your requirements. This 1kgof protein powder by Sunwarrior contains 40 servings. The blend is formulated with raw organic pea protein, cranberry protein and raw organic hemp seed protein for a full amino acid profile. The sugar and gluten free mix is suitable for vegans with each serving providing 19g of protein and 100 calories. In a delicious vanilla flavor, the sweet and smooth blend has no chemicals or artificial ingredients and can be used pre or post workout. Drink the protein blend on its own or mix with other ingredients to make a refreshing smoothie. 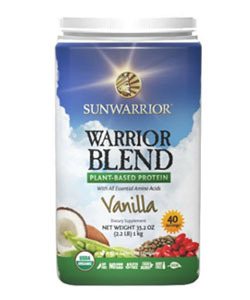 The Sunwarrior Warrior Blend, Plant Based Protein, Vanilla is slightly more expensive than other brands, however, it provides a high-quality protein source and is easily digestible. With top reviews on Amazon, this product is highly recommended. 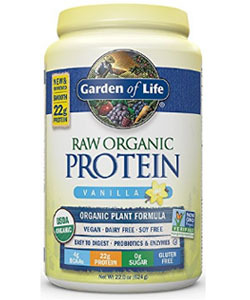 A 626g organic vegan protein powder by Garden of Life is the next product on our top 5 list. This muscle building protein contains 13 raw, organic sprouts, vitamins A, D, E and K, as well as 22g of protein. Ideal as a post workout shake, the vanilla flavoured powder boasts 12 enzymes and 1 billion CFU probiotics for easy digestion and good health. The pea protein powder is an official protein powder of USA Track and Field and contains a complete profile of amino acids. The gluten, dairy and soy free formulation is also great for vegans and vegetarians or those who wish to supplement a low-carb diet. The price, value and quality blend with no fillers, preservatives or sweeteners makes the Garden of Life Organic Vegan Protein Powder a top product on our must have list. 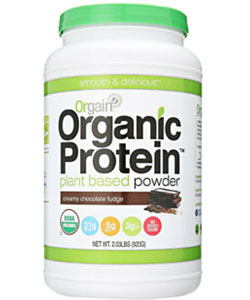 This 2.03lbof organic plant based protein powder by Orgain is formulated with organic pea protein, organic brown rice protein, organic chia seed and organic hemp protein. Each serving contains 21g of protein, 5g of fiber, 3g of carbs and 150 calories. The gluten free formulation is suitable for vegans and is ideal for those seeking a protein boost on the go. The smooth cream chocolate fudge shake is free from artificial ingredients. As a best seller on amazon, the Orgain Organic Plant Based Protein Powder in Creamy Chocolate Fudge is highly recommended due to its excellent value for money. As one of the most trusted brands on the market, Vega has a second product on our top 5 list of best non-dairy protein powders. 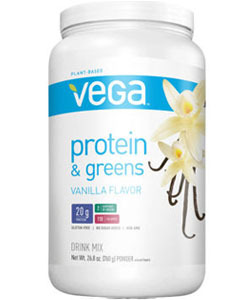 The Vega Protein & Greens Plant Based Protein Powder boasts 20g of complete protein per serving, as well as 2 servings of vegetables, including spinach, kale, alfalfa and broccoli. Furthermore, each serving contains 120 calories and 50% of the recommended daily amount of vitamins and minerals. Each 1.68lb tub of products contains 20 servings and is formulated with pea, hemp and sacha inchi protein. The gluten free formula is free from artificial flavors and sweeteners. The overall premium quality of this product along with the rich taste makes this product an addition on our top 5 list. Here are the next 5 best non-dairy protein powders we highly recommend. 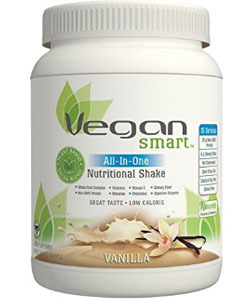 Naturade Vegansmart All-In-One Nutritional Shake is a 22.8oz tub of protein powder. Each serving contains 20g of plant based protein which is suitable for those who are searching for a post workout shake or those who require extra protein from a nutritional supplement. The gluten free formulation contains no artificial ingredients, however, there are 5g of sugar per serving from organic cane sugar and other sweeteners. 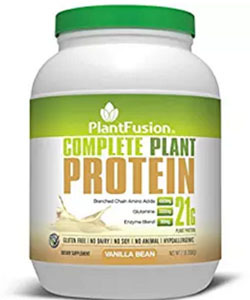 PlantFusion Complete Protein Powder is a 2lb tub containing 30 servings. Each serving boasts 21g of plant based protein as well as 120 calories, 4500mg of BCAA’s and 3350mg of glutamine. The blend is formulated with pea protein isolate, artichoke protein, organic sprouted amaranth powder, and organic sprouted quinoa powder. Free from gluten and artificial ingredients, the product is easy to digest and is ideal for those who need extra protein in their diet. 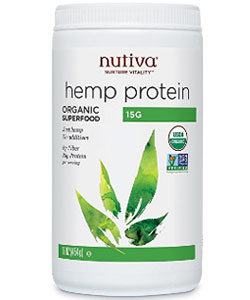 This 16oz tub of hemp protein powder by Nutiva contains 15g of protein, 2g of essential fatty acids and 32% of your recommended daily amount of fiber. The organic formulation contains 66% edestin in your 15g of protein per serving, making it easy to digest. Free from pesticides, hexane, dairy and sweeteners, the formula is packaged in a BPA-free container. The price and blend of this powder make it excellent to add to shakes, smoothies or almond milk. 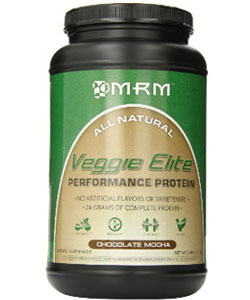 This 2.45lb tub of protein powder by MRM boasts 24g of plant based protein per serving and each tub provides 30 servings. Easy to digest, this protein powder contains a complete amino acid profile and uses the best pea and brown rice proteins. The blend is free from artificial ingredients and is suitable for anyone needing a boost of protein. 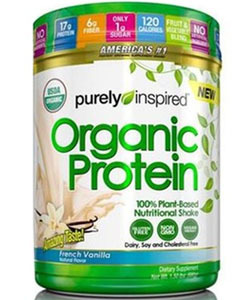 Purely Inspired Organic Protein Shake is a 1.5lbs tub of plant based protein, providing 20 grams of protein per serving and 7g of fiber. The gluten free formulation contains no artificial ingredients or fillers. The excellent price, value for money and organic blend make this an addition to our top 10 list. 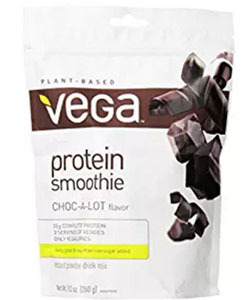 The Vega Protein Smoothie, Choc-a-Lot, Pouch is the best tasting non-dairy protein powder. The 9.2oz pouch features 10 servings and each serving has 15 grams of complete, plant based protein. Furthermore, each serving contains 90 calories and two servings of vegetables. The delicious flavor of chocolate with no sugar, caffeine or aftertasteis the perfect way to enjoy a tasty nutritional supplement to gain extra protein in your diet. 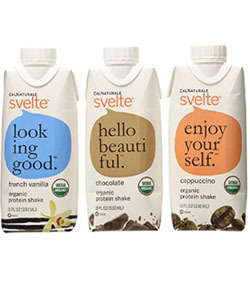 This pack of 12 CalNatural Svelte Organic Protein Shake is a convenient way to take your protein supplement on the go. With three tasty flavors of cappuccino, chocolate and vanilla, the vegan blend contains soy milk with each serving providing 20% of your daily intake of protein, 5g of fiber, as well as vitamins and minerals. Use as a meal replacement or as a snack. The premium formulation is great value for money and is gluten free. There are many things you might want to consider when purchasing a non-dairy protein powder. Here are some of the different features to look out for. Size – How much powder are you getting for your money? Digestibility – Is the formulation easy to digest? Amino acid profile – Does the blend contain a complete amino acid profile with all the protein your body requires? Plant or soy based – Is the formulation made from plant based proteins or soy? Price – Is the price good value for money? Choosing a non-dairy protein powder can be complex. However, reading consumer reviews will help you to decide which product is the best for you. Consider your requirements carefully and you’ll be able to select the best option.